Virtual worlds let us do things that are otherwise impossible. On platforms like Second Life, we can take on new identities, defy the laws of biology and physics, and push social boundaries with little to no consequence. But do these virtual experiences have any effect on our real lives? That’s the question Donna Davis and Tom Boellstorff wanted to answer with a National Science Foundation-funded study. Since 2011, Davis, an assistant professor in the UO School of Journalism and Communication and director of its strategic communication master’s program, and Boellstorff, a professor of anthropology at the University of California, Irvine have been looking at the effects of virtual support groups for people with disabilities. During the course of their recently concluded, three-year study, they discovered that using an avatar in a virtual world can have a profound effect on a person’s quality of life. Take, for example, Fran, a 91-year-old woman with Parkinson’s disease. After watching her avatar dance and perform tai chi in Second Life, Fran was able to stand without the assistance of her lift chair. Davis told the story of Fran and other members of the Second Life disability community at the inaugural UO Wings Presidential Speaker Series. She admitted it’s been difficult to get people to see the connection between virtual world research and real communication outcomes. But her work has revealed a clear link: Virtual worlds and the avatars people use to inhabit them greatly affect how they interpret and express their own — and others’ — visual identities. The virtual disability support group has also helped its members develop strong social networks and interpersonal relationships. It has even created employment opportunities. Davis stumbled onto virtual worlds 10 years ago while pursuing her doctorate at the University of Florida. 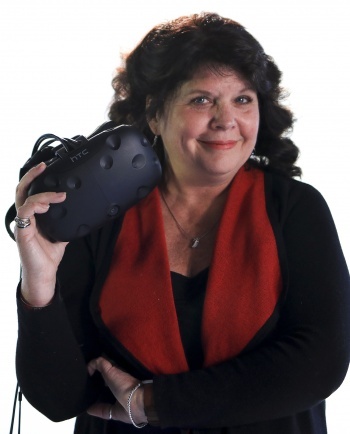 After taking a graduate seminar in the then-cutting-edge technology, she changed the focus of her dissertation to the relationships that form in virtual worlds. How real are they if they're only online? How do they affect the way we think about relationships in the physical world? “That relationship perspective of virtual reality is the piece that has driven my research agenda all the way through,” she said. Although virtual spaces offer advantages in communication and community building, Davis acknowledges that the technology still has a long way to go in granting accessibility to all. Headsets, for example, are often too heavy and can create motion sickness in some people. "Being embodied in a space where they felt like they looked — healthy and young — ... it leveled the playing field." Even tasks as seemingly simple as sending and receiving text or voice communication can be problematic. Now that the National Science Foundation-funded study is complete, Davis is pivoting her research to focus on emerging opportunities in virtual reality as well as the ethics of VR technology and experience. Davis will delve deeper into this new area this fall, when the School of Journalism and Communication begins development on a new virtual reality lab at UO Portland. The school has already built two smaller VR and 360-degree video studio spaces in Portland, where students in the multimedia journalism master’s program are learning how to shoot and edit 360-degree video and use photogrammetry to convert physical spaces into virtual representations. Although she’s expanding her research, Davis has no intention of abandoning the communities she formed in Second Life.